The past years have seen great positive change for people in recovery from childhood trauma. No longer forced to suffer alone, survivors and allies continue to develop resources and support systems that move the recovery process forward. We are fortunate to have a world-renowned facilitator in this field available for this day of healing. Group size is limited. Early registration recommended. This full day workshop in beautiful Abita Springs, Louisiana is for non-offending adult female and male survivors of sexual child abuse and other sexual trauma. Our goal is to offer a recovery experience in a safe, powerful environment of shared healing. The Women's Center for Healing & Transformation is a welcoming historic building and an intentional space ideal for this purpose. The workshop/day retreat will provide a variety of healing activities: sharing, writing exercises, emotional expression, group discussion, relaxation and even fun in a safe, nurturing environment. Opportunities will be available for men's and women's small groups as well as the benefit of being in group together as survivors across gender. Considerable attention has been paid to creating a safe, nurturing environment respectful of participants' needs. The workshop focuses on the reality of recovery as revealed by survivors. Pre-registration and payment are required to reserve your spot. On-site registration may be available if space allows, though will be considered on first-come, first-served basis. Each participant must register separately. 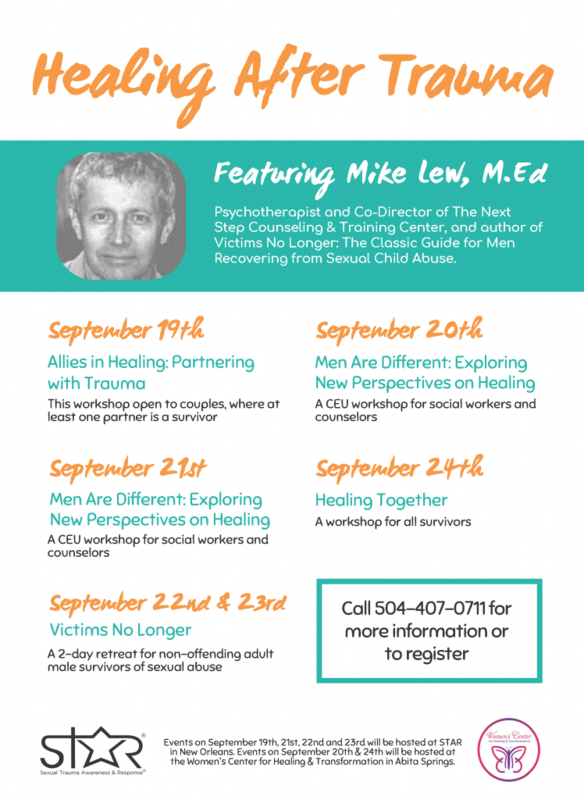 ​This event is part of the Healing After Trauma Series, co-sponsored by the Women's Center for Healing & Transformation and STAR (Sexual Trauma Awareness and Response™). See below or click here for additional workshop offerings.